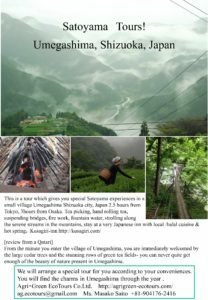 This is a tour which gives you special Satoyama experiences in a small village Umegashima Shizuoka city, Japan 2.5 hours from Tokyo, 3hours from Osaka. [review from a Qatari]: From the minute you enter the village of Umegashima, you are immediately welcomed by the large cedar trees and the stunning rows of green tea fields- you can never quite get enough of the beauty of nature present in Umegashima. We will arrange a special tour for you according to your conveniences and interests. You will find the charms in Umegashima through the year. Please contact us and send us your inquiries.